Some cute little shorts featuring the characters of Toy Story have already made their way to the big screen, even after Toy Story 3 hit theaters. Now another new one is coming this Halloween, but it's a full 30-minutes long and will be getting the TV treatment. Given the timing of the short's premiere, it's no surprise to learn it's called Toy Story of Terror, and it mostly focuses on Jesse (Joan Cusack) as Bonnie takes the toys on a road trip and they end up staying in a spooky motel after the car breaks down. But don't worry, because Woody (Tom Hanks), Buzz (Tim Allen) and some of the other toys will be there too. Mr. Potato Head (Don Rickles) and Rex (Wallace Shawn) are also in the mix along with Bonnie's toys Mr. Pricklepants (Timothy Dalton) and Trixie (Kristen Schaal). And there's a new voice joining them with Carl Weathers playing Combat Carl, the same toy fans should remember being blown up by Sid in the original Toy Story. Obviously, the short is meant for kids, but supposedly there will be some clever references to Predator (because of Weathers) and also Psycho and Aliens. 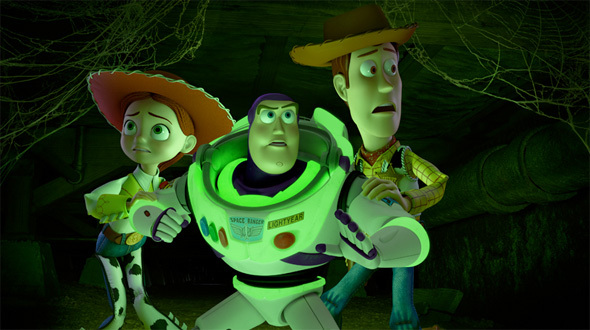 These shorts are a cool way to keep Toy Story relevant, just in case another sequel comes along sometime down the road. Sound good? I doubt they're making much off of a 30 minute short that will likely play on Disney channel or before one of their other films. This seems like it's more for the fans and I know my kids and I will be ecstatic to revisit the characters. Do I smell a TOY STORY 4?